I have a new whip in the garage. 61cm Bianchi Mono-Q. Yea its only 105 but that way it will be easier to sell next year. Anyway. I got 3 hours of riding on it last Saturday with Cinco. Blue bird skies, in the 80s, felt like San Diego weather. Built up stock out of the box.... 18.29lbs for a 61cm. This frame is roughly 40grams heavier than the big brother T-Cube. They share the same geometry and one grade of carbon fiber, IM600 fiber. Monocoque construction, FULL carbon fork and if you build this with D/A or Force you'd be looking at a sub-17 lbs bike in this size. 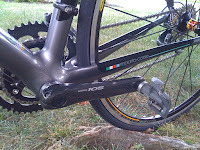 The bottom bracket is well oversized and provides plenty of stiffness for a $2599.00 rig. 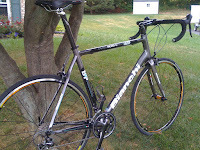 Not as stiff as the T-Cube but definitely stiffer than other brands that I have ridden in this price range. The chainstays have some beef to them which provide adequate stiffness and good acceleration. More later as Interbike approaches.